Dr. James B Beard is the worldÆs leading authority on turfgrasses and turfgrass science. He spent most of his career in academia, first at Michigan State University, then at Texas A&M University, where he is currently professor emeritus of turfgrass science. He has pioneered investigations concerning turfgrass and the ecology of grass, and has published widely and lectured both throughout North America and internationally. Currently, he guides turfgrass research and education programs, especially internationally, while also instructing in turfgrass education through seminars, papers, manuals, and books. He has also served on many national committees. Dr. Beard holds four degrees, has written and published prolifically, including more than 700 scientific papers and technical articles, as well as numerous books. He has lectured widely throughout North America and abroad, and has served as a technical advisor to turfgrass organizations in more than a dozen countries. Dr. Beard has been the recipient of the Turfgrass Science Award and the Crop Science Research Award of the Crop Science Society of America. He was the first president of the International Turfgrass Society. He has been elected to the Board of Directors of CSSA, ASA, CAST, and ITS; and honored as a Fellow of CSSA, ASA, and AAAS. Dr. Beard and Harriet J. Beard, his wife and long-time collaborator, have written numerous books and jointly received the Oberly Award of the American Library Association. Dr. Beard currently serves as President and Chief Scientist at the International Sports Turf Institute. "One of the key characteristics of a profession is a body of technical terms that are unique to the profession or specialty area. Turfgrass science and culture certainly has a unique group of words or terms that distinguish this profession. Effective communications among turfgrass professionals relies on an understanding of and proper use of the turfgrass terminology that has evolved. Many of the terms now in common use developed during the past four decades in concert with the emergence of turfgrass science. Thus, this dictionary of turfgrass terms has been written as a quick-reference source for all segments of the vast turfgrass industry. Many words defined in this turfgrass dictionary may not be found in a standard dictionary. 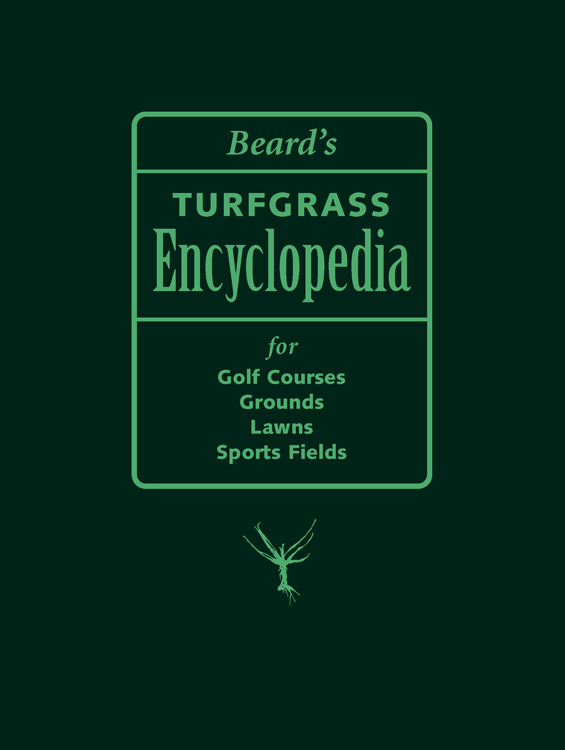 The guiding criteria in the development of the turfgrass related definitions found in this dictionary were accuracy, accepted usage, and readable clarity. A key was accepted usage. Some book authors attempt to impose new terminology through the introduction of new alternate terms. Such a revisionist approach has been avoided in the development of this dictionary. New or revised terms were included only where a need for accuracy and/or clarification justified the change. The definitions for terms basic to the turfgrass field were derived for this dictionary from consensus inputs by the members of the C-5 Turfgrass Science Division of CSSA as published in: * Glossary of Crop Science Terms. 1992. Robert F Barnes and James B Beard (editors). Crop Science Society of America,Madison,Wisconsin, USA. 88 pp. The principal sources for the common and scientific names of the turfgrasses and the definitions of soil science terms were as follows: * A Checklist of Names for 3,000 Vascular Plants of Economic Importance. 1986. E.E. Terrell, S.R. Hill, J.H. Wiersema, and W.E. Rice. USDA-ARS Agriculture Handbook No. 505,Washington, D.C., USA. 241 pp. * A Synonymized Checklist of the Vascular Flora of the United States, Canada and Greenland. 1994. Second edition. John T. Kartesz Vol.-1 Checklist. and Vol.-2 Thesaurus. Timber Press, Portland, Oregon, USA. 622 and 816 pp. * The Grass Genera of the World. 1992. Revised Edition. L.Watson and M.J. Dallwitz. C*A*B International, * Glossary of Soil Science Terms. 1997. Soil Science Society of America,Madison,Wisconsin, USA. 138 pp. The weed, disease, and insect terms, plus the common and scientific names, were derived principally from the following three scientific organizations: * Selected Weeds of the United States. 1970. Agricultural Research Service of the United States Department of Agriculture,Washington D.C., USA. 463 pp. * Fungi on Plants and Plant Products in the United States. 1989. David F. Farr, Gerald F. Bills, George P. Chamuris, and Amy Y. Rossman. APS Press, St. Paul, Minnesota, USA. * Compendium of Turfgrass Diseases. 1992. Second edition. Richard W. Smiley, Peter H. Dernoeden, and Bruce B. Clarke (editors). APS Press, American Phytopathological Society, St. Paul, Minnesota, USA. 98 pp. * Handbook of Turfgrass Insect Pests. 1995. Rick L. Brandenbarg and Michael G. Villani (editors). The Entomological Society of America, Lanham, Maryland, USA. 140 pp. Terms not defined in the publications of these leading scientific organizations were based on definitions presented in Turfgrass: Science and Culture of Prentice-Hall, Inc. (1973) and Turf Management for Golf Courses of Ann Arbor Press (2002), both authored by James B Beard. To avoid the presentation of definitions that are too remote from common usage within the English language, Webster's Third New International Dictionary - Unabridged (1986) was used as the standard frame of reference. Those terms that were no longer valid or were no longer in accepted and/or common usage will be listed, but identified as "obsolete" or "synonym," along with a reference to the more appropriate term and/or the former definition. The authors wish to express appreciation to the many hundreds of individuals who generously provided key information needed to compile this comprehensive work. It is our hope that this publication will aid in advancing the technical expertise and professionalism of the practitioners that comprise the field of turfgrass science."